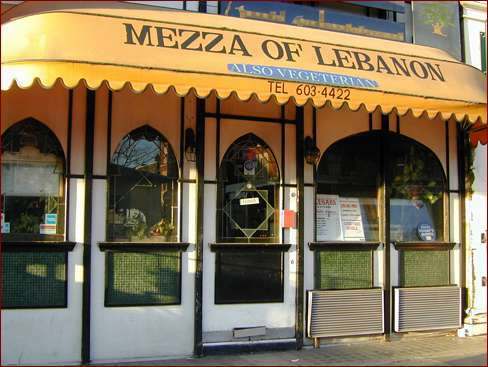 On High Street Kensington is one of our favorite London eateries: Mezza of Lebanon. Unfortunately they're closed, and no hours are posted. Perhaps we'll try again, when we visit Harrod's, or we'll call the phone number before we return. We return to another Lebanese restaurant we just passed, the Al Dar III, which is much more urban and sophisticated than our oasis-like favorite. We are clearly in the cultural minority here. 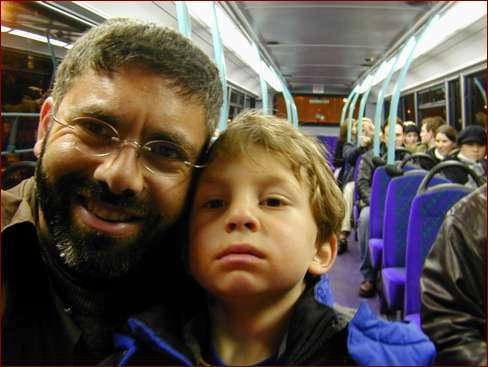 Young and old, almost everyone here are Lebanese expatriates. We sit next to an elderly couple, clearly from Lebanon, and I watch as they work their way through a half-dozen courses. They make a great pair. Because of Lila's diarrhea we've been reluctant to let her have much. She's had some pretzels and other mildly binding foods, but now she's demanding food, and so we let her have a bit of everything she wants. Here's thrilled to see a tomato, a favorite of hers. It's only at the end of our meal that I remember the camera. 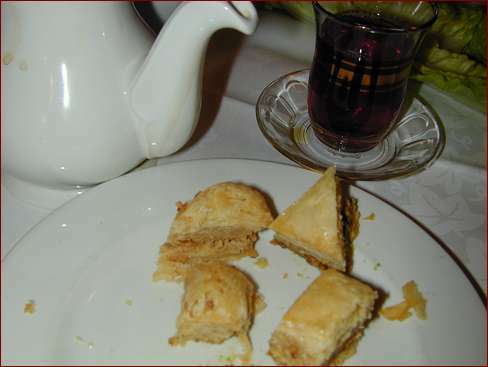 Here's our teapot and a my glass of tasty mint tea, along with some of the many kinds of baklavah we enjoyed. Mmmm. We're tired, we're satieted with deligtful fare, and we're ready to head on home. But what about Rose's bus karma? Even though we haven't had great luck with the London buses, Rose is always enthusiastic about them, so we try once again. 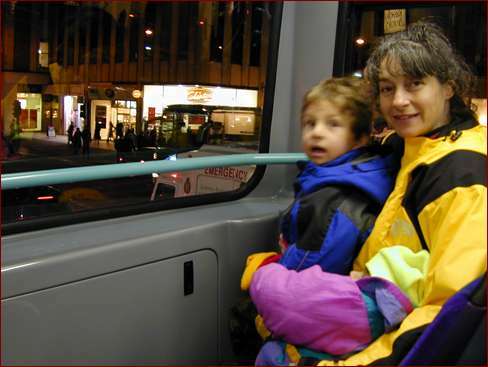 Here the family are sitting in the front seat of the upper balcony of a double-decker bus. Lila is refusing to look at the camera, yelling "oh no" each time I call her name. 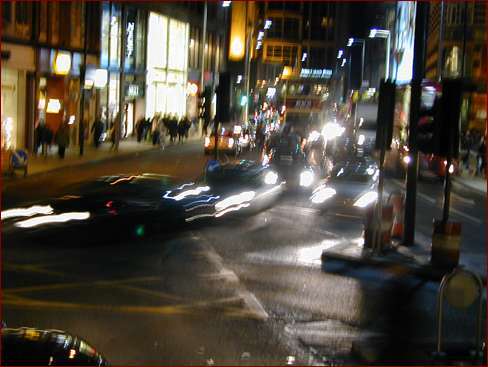 Following are two rather abstract pictures of the traffic along High Kensington Street. In this picture things are rather stop-and-go, but at least it's somewhat moving along. 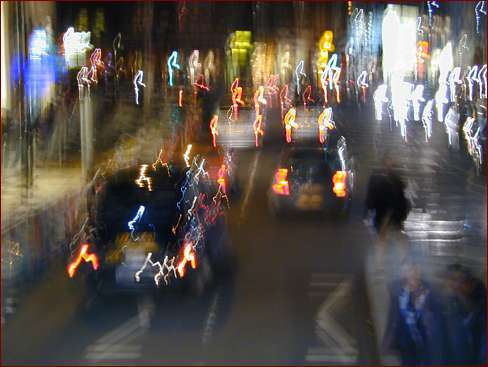 Now we're waiting at a light, and you can easily see the reverse traffic flow: the oncoming cars are to our right, and our traffic is on the left. Isaac noticed the steering wheel of the minicab (we took from Heathrow) was on the other side, but he hasn't noticed traffic (yet). The traffic grinds to a halt, and Lila gets very fussy about it. We get off and start strolling along Hyde Park. It's dark out, and we can't see Kensington Palace right now. 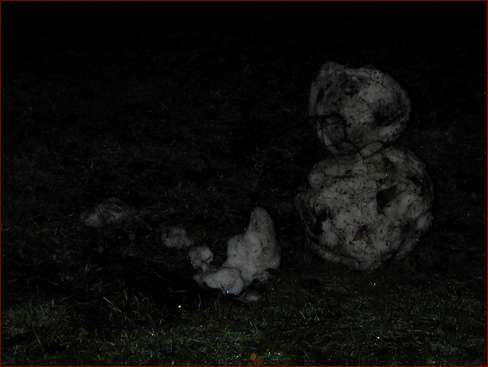 We spot a snow kitten, melting but still recognizable. We jog along, both children happy at my calling cadences as we run. (I really must look up more of those Army, Airborne, and Ranger songs I liked so much when I was in the service.) I'm really hot and sweaty by the time we arrive at the Knightsbridge Underground stop. 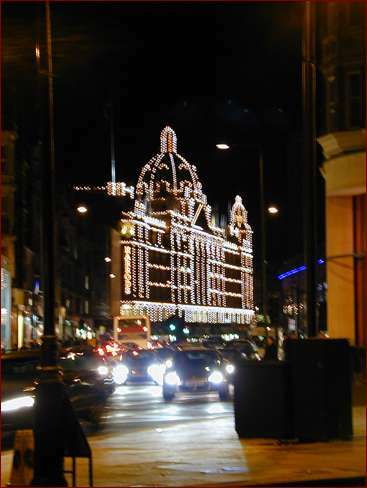 Here we can see a just-closed Harrod's. We'd wanted to let the kids play in the toy area; in the next few days, hopefully. Those who know me well know that I'm a map geek. I've collected a few, and I'm always in awe of the wonderful design and typeography of the London Transport maps, posters, and signage. (I learned today that the typeface is Johnston Sans; I'll see if I can track it down.) This is a wonderful above-ground view of the Piccadilly line; a view of London I've not seen before. We're nearing the end of our day. It gets dark early here, and we're all tired and in some state of being sick, so it's hard to remember whether we ended up back at the hotel at 1700, or 1900, because it all feels like 2300. 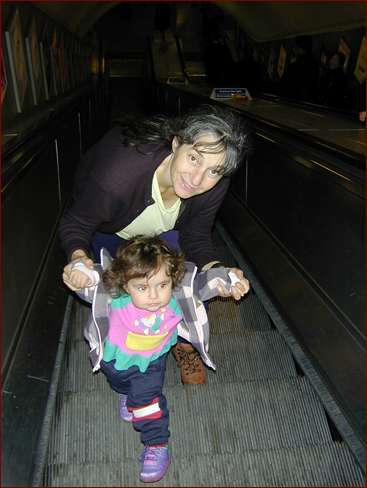 Just as Isaac loved escalators when he was a toddler, Lila now loves them. Here she and Rose are following the "Way Out" signs in the Tottenham Court Road Underground stoup. 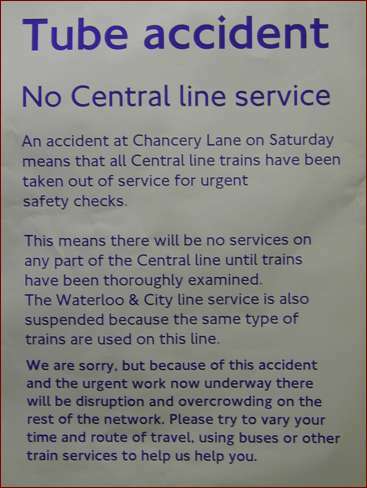 In addition to the "industrial action" (strike) of the fire brigades the subway system is being impacted by a closure of the Central, Waterloo, and District lines. Luckily our needs and desires on this trip don't really require these lines. Now we're on the last leg of leaving the Underground. Rose (in yellow) and Isaac (in blue) can be seen at the far left. On our last visit some of these escalators were broken, which really is a bother. 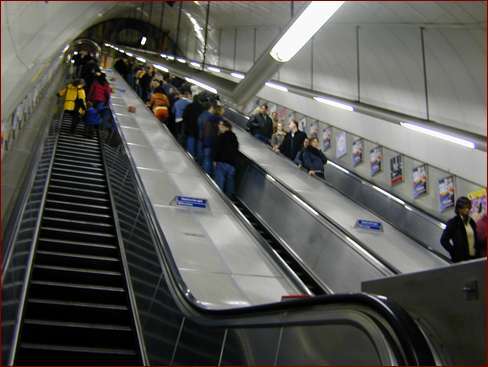 The London Underground is deep down, and walking up just isn't fun. 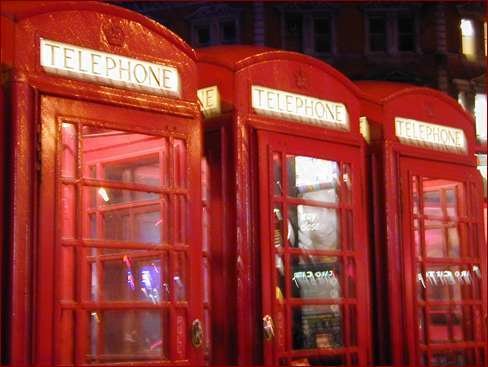 At Tottenham Court Road I spy a row of the traditional phone booths (not the newer, ugly, British Telecom ones). It's been an adequete day, full of fun and laughter, but marred by lots of feeling poorly all around. But we're still working on it, hopefully tomorrow will be a better day. We're planning on visiting the Strand.